There were few people who, to quote the UConn athletic department’s online motto, bled blue more than Jon Wholley. A Connecticut native who played for the UConn football team and had multiple stints as an assistant coach with Hus-kies, Wholley again departed the program this week, a week after UConn concluded spring practice. The school announced Tuesday that Wholley, the linebacker coach the last two seasons, was departing and that Jarren Horton is replacing him. Wholley is going to Mississippi State to join coach Joe Moorhead’s staff, multiple sources said. Moorhead is the former UConn offensive coordinator and former head coach at Fordham. Wholley worked with Moorhead at both schools. In January, running backs coach Terry Richardson left UConn for Mississippi State. 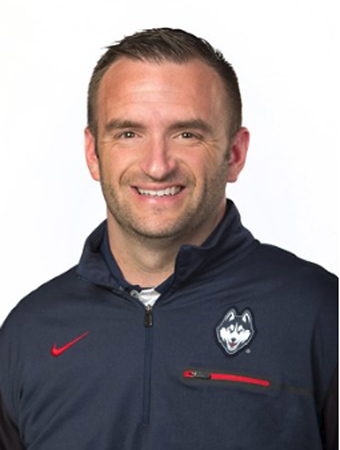 Wholley earned an undergraduate degree from UConn in 2004 and a master’s in 2008. He was an assistant coach with the Huskies from 2010-13 and rejoined the staff when coach Randy Edsall returned in 2017. Wholley was an assistant at Fordham under Moorehead for three seasons after departing UConn the first time. Horton comes to UConn after serving as a secondary coach with Atlanta of the Alliance of American Football. Before that, Horton was a graduate assistant at Southeastern Louisiana. Horton played defensive back at Portland State from 2010-12 and graduated from Central Washing-ton in 2015. After graduating he worked two stints at Vanderbilt as defensive analytics assistant. Posted in Newington Town Crier, UConn on Wednesday, 20 March 2019 20:41. Updated: Wednesday, 20 March 2019 20:43.